If you listen to KFFR, our local radio station, you know that they broadcast from the Fraser Valley and the headwaters of the Colorado River. Yes, the most overworked river in the Southwest, providing water for over 35 million people, starts right here in Grand County. Not all of the people using water from the Colorado River live west of the Continental Divide. Starting in the 1890s, some of the water from the headwaters of the Colorado River began flowing east through a transbasin diversion called the Grand Ditch. 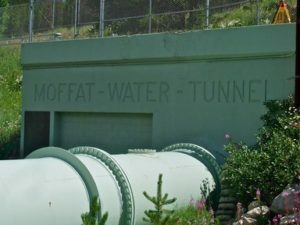 In the 1930s more of the headwaters began flowing east through a new diversion tunnel called the Moffat Tunnel. Anyone who skis Winter Park has seen the big green pipe that delivers water to this tunnel. In the 1940s, the Colorado Big Thompson project started diverting water through the Adams Tunnel making Grand County the most impacted county in Colorado from these transbasin diversions. Diverting water from the natural environment is a right guaranteed in the Colorado Constitution. Water law allows up to 100% of a river to be diverted if that water can be put to a beneficial use identified by water law. Leaving water in a river was not originally considered a beneficial use. It doesn’t take much to see that water law and our natural environment were set on a collision course over 143 years ago. Since the 1970s, federal laws protect streams from the impacts of water development, but when the Moffat Tunnel and the Colorado Big Thompson project were built they didn’t exist. Now both projects have requirements to maintain some downstream flows. Today our state places a lot of value on the natural environment and uses our natural beauty to drive our tourist economy. Since Denver Water and Northern Water have a right to take the water, the people in Grand County began working with them to establish agreements to protect both their rights and the environmental health of rivers on the West Slope. The agreement with Denver Water is called the Colorado River Cooperative Agreement (CRCA) and was signed by parties from both sides of the Divide, including several West Slope counties and water organizations, and became effective in 2013. Northern Water is not part of the CRCA but has a separate intergovernmental agreement (IGA) with Grand County and other West Slope entities. Both agreements cover many aspects of river protections. The beauty of the agreements is that we will work together to address past, present and future impacts that our rivers are experiencing. River protections include money, coordination of diversions and participation in an adaptive management group called Learning By Doing (LBD). While money helps, it’s not enough to do all the work that our rivers need. Other sources of funding will need to be found through environmental grants and from entities impacting our rivers on this side of the Divide. More important to our rivers is the coordination between the largest diversions in the county and how those diversions are operated. LBD is set up to improve communication between the diverters and the West Slope partners. 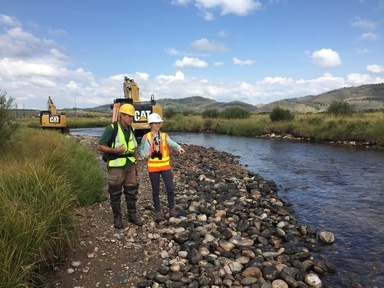 Once a week during late spring through early fall, Denver Water, Northern Water and West Slope representatives discuss how to use the flexibility in the diversion systems to operate in a more environmentally friendly way. We have been using this communication to reduce high stream temperatures and improve the flushing flows to move sediment that clogs streambeds. LBD is one of the most important aspects of the CRCA and the IGA with Northern Water, and plays a direct role in Grand County’s stream health through open communication and collaboration. The partners in LBD are Denver Water, Northern Water, Grand County government, Colorado Parks and Wildlife, Colorado River District,Middle Park Water Conservancy District and Trout Unlimited. The goal of LBD is to restore or enhance the condition of the river health in Grand County through projects and improved communication between the partners. LBD is not supposed to be effective until permits for Denver Water’s Gross Reservoir expansion and Northern Water’s Windy Gap Firming Project are secured, which has not happened yet, but because LBD partners were eager to get the healing process started, it is already in its fourth year of operation and has completed a river channeling project, two riparian improvement projects and has developed a robust monitoring program to continuously examine the health of Grand County’s rivers. I hope to write about LBD in more detail in a future article. Some other commitments from the Front Range water suppliers — contingent on completion of the permitting and other thresholds for the expansion projects — include: Denver Water’s commitment of 1,000 acre feet of water for environmental purposes, funding for water quality improvements, and funding assistance so that Grand County can pump and store environmental water in Granby Reservoir. 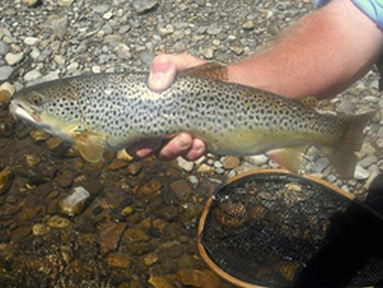 Commitments from Northern Water include the ability to pump and store water that can be released in late summer when Colorado River stream temperatures are high, participation in LBD, and funding and participation in the Colorado River Connectivity Channel project, which will reconnect fish habitat in the Colorado around Windy Gap Reservoir.